Why wouldn’t I open a brewery in a town of 2,000 people where 90% of all beer consumed is Busch Light. I get asked all the time what made you decide to open a brewery? I always chuckle a bit because in all reality it all started with my brother, I think flying on a plane somewhere, and emailing me saying we should open a brewery. I jokingly replied saying definitely would be interested. I still have the emails, and I laugh when I go back and read them because never in my wildest dreams did I think it would actually happen. Namaste + Cheers! My 2 favorite things - BEER & YOGA! By far my favorite event we do at River Ridge Brewing. I have worked in the craft beer industry since 2011. I started as a brand ambassador and worked my way up to craft beer rep for a beer distributor in eastern Iowa. After doing this for numerous years, I decided I was sick of driving. I was on the road sometimes 5+ hours a day, and the job was no longer making me happy — side note. I am a believer in doing what you love. You only get one life so why live one that is miserable. I don't want a job that I wake up and dread going into every day. I took a pay cut when I left my job with the distributor, but to me, that didn't matter. I like to try and measure my life in happiness and joy not dollars in my bank account. Now Nick and my Dad maybe aren't big fans of my philosophy, but it is true. As they always YOLO! Don't get me wrong; there are down days at any job including mine. It is called a job for a reason. ;) However, I knew the day I left the distributor I would somehow end up back in the craft beer business. The culture around craft beer is what I love. The second I started working in craft beer I knew I had found my calling. Not just because I love beer, but the people and the mindsets of the craft beer world just matched me. The winning logo design from the best graphic designer Amanda! We started home brewing more seriously. We took our beers to our friends and family and asked for their opinions. We started kicking around names for the brewery. The first one that stuck was Boat Works Brewing. After a bit we felt like it didn't have the best ring to it, so we scratched it. If you are interested in that domain, you can now have it. I just let that little gem go. One of my favorite things to do is buy domains. Anytime I have a business idea, I tend to have a lot, I buy the domain right away. That way no one else can steal my fantastic idea like www.knitzandshitz.com. I will just let that one right here. Then one day we were brewing on a ridge that was overlooking the river and thought what about River Ridge Brewing. It also happened to be the name of the road where we home-brewed. Real creative I know. River Ridge Brewing was decided on, and we hit up Nick's sister to create a logo for us. I believe in January 2016 we started looking at locations. By spring we were making renovations to the building and setting up our equipment. Those first months of brewing were brutal. Talk about a learning curve. We had all been home brewing 5-gallon batches for some time and had that down. Jumping to a 1 barrel system (31 gallons) didn't seem like it would be a stretch, but it was. I am talking 10+ hour days to brew one batch. Learning the new system and all the tricks took some time. There was one day where we had a fermenter full of beer, and it started leaking everywhere! This was after 7 hours of brewing already. We had to take the fermentor apart, with the beer in it, and fix a ring that wasn't sealing. Seriously. I have the photo to prove this. 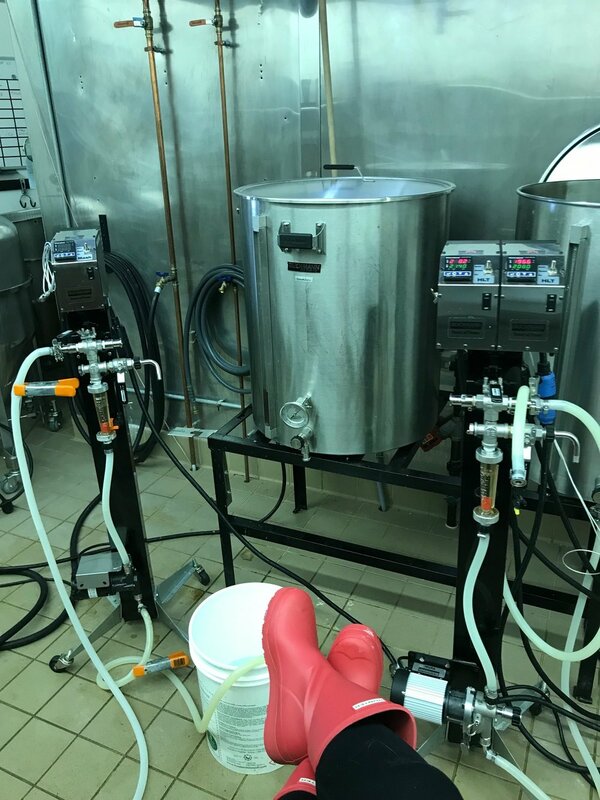 I have lots of pictures showing all my bad luck with brewing. Mind you this was all on top of working full-time jobs. To this day we all still work day jobs. Thank god we have come along way from those disastrous brew days. There are always hiccups here and there. Not every beer can be perfect, but after three years we are learning some tricks to the game. You can see just a few of my clumsy mistakes below. We might have gotten the brewing system down, but nobody really tells you all the details that go into operating a brewery. You are a glorified janitor. I spend most days cleaning either the brewery or taproom, which includes the restrooms. No one said owning your own business meant cleaning public toilets. If they had, I might have rethought this whole brewery thing. Not to mention goodbye social life. The first two years we were open I pretty much worked every Friday, Saturday, and Sunday. Along with almost every day of the week. You must love craft beer if you ever are even thinking about opening a brewery for real. You miss out on so many family functions, friends outing, boating days and much more. I am not complaining by any means. I feel like watching my Insta stories, and Facebook post all make the business look glamorous. It doesn't show the blood, sweat, and tears behind the scenes. Designing the taproom was the best part. All the wood in it came from our family farms. The shelves behind the bar are my grandpa's ladders that we took apart — everything in the taproom we did. Even poured the cement bartop — another learning curve for us. I painted the blue wall I can't remember how many coats to get that blue. Everything in the brewery has a story and a connection to us — even the beer names. We had been brewing beer on our system for a bit, but the good old government hadn't approved our license yet so we couldn't sell our beer. We decided to make people work a bit for it. We invited our family down one night and told them they could drink all the beer they want as long as they help come up with names for them. Only criteria were the names had to connect to Bellevue or our family. Let's say a good portion weren't PC. We sat there drinking and writing names we liked down on a paper plate. Nobody had even thought of bringing a notebook. Next, we had someone Google them to make sure they weren't taken. 99.9% were so we just kept drinking till we came up with names that weren't. Stop in the taproom sometime when I am there and I can tell you the story behind each name and also can fill you in on the utterly inappropriate names we came up with. I took this photo minutes before opening our doors. I was so excited and so naive for what was to come. Also I was waiting outside my house for the UPS truck to come. I had packages on it that I needed for our opening. Like our cash drawer. Talk about cutting it close! September 2016 we opened the doors to our taproom. We did no big open house or soft opening. I just unlocked the door at 4 pm on Friday, September 16th. I shot this on Facebook live. That was it. I can remember the first couple that came in. They sat down and decided to try a flight of our beers. I poured them the flight, and as I handed it to them, I said here ya go and thanks for being our first customer. They replied the first customer of the day? I said Nope. First customer EVER! The next couple of years are a blur. But I look at this business I had a part in creating, and I can't help but smile. To all those who said a brewery in Bellevue would never work, your barstools are too uncomfortable nobody will sit on them a long time, your hours will never work, you need different t-shirts, why did you name your beer that name it is awful, this beer taste like soap, you don't have Busch Light, I say boo hoo. Thanks for the constructive criticism but I am pretty sure the doors to RRB are still open. Cheers! Proud member of Pink Boots Society!